Whether it has been a long day at the office or you are simply ready for a good night of warm, snuggled up sleep, there is nothing quite like getting into bed and curling up under your duvet. There is something very comforting about the warm, soft and wholly snuggly feel of wrapping the thick and inviting duvet around you for comfort or simply to keep out the winter chill. A night on the sofa with a glass of wine, a box of chocolates and a familiar duvet can right plenty of weekday woes and leave us feeling rejuvenated. Most households now use duvets as bed coverings rather than sheets and blankets but, despite spending 8-10 hours a day in its company, we rarely give much thought to the quality of the duvet itself or whether it is the perfect one for us. Bed clothes are often chosen for design or price and duvets in particular can go for years without being replaced; they are rarely or irregularly washed due to the general inconvenience of doing so. Technology has changed in recent years and, for a very reasonable cost, you can now have a duvet perfectly suited to your personal warmth and weight requirements that will enhance your sleep and make your rest time even more effective. 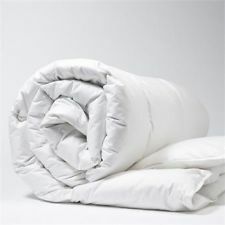 A luxury duvet, has many benefits over the traditional duvets that have been in our homes for years. While wadding has replaced feathers in recent decades, goose down and feathers are now cornering the market for luxurious, machine washable bed covers that repel dust mite infestations and have anti-bacterial properties. With dust mite and bacteria reduction, allergies and odours are also minimised while the new style filling wicks away moisture and helps regulate the sleeper’s temperature. The result is a cleaner, healthier and more body friendly night of sleep as the sleeper is able to maintain a core temperature easily and breathe naturally. Goose down and feather duvets can be easily washed and cared for at home in a normal washing machine and are the ideal treat for anyone who loves their bed and wants to have the perfect night of sleep!